So I've been finding some great blogs through Instagram lately, one of which is Head in Her Books. She recently did a post on the OTP Book Tag, which I enjoyed reading and so I thought, as a total fangirl, I should give it a go. I've included some of my favourite fanart works from Society6 shops, so you should also check them out. I honestly can't think of an OTP I have that other people dislike, so I'm going to interpret unpopular as 'not well-known' rather than 'not liked'. I'm going to go with Charlie and Emily from the Brookfield/Ashbury series by Jaclyn Moriarty, who I have loved since high school. I was always terribly disappointed that I never had a cute boy wait for me at the school gates, kicking a pebble. So before I read Queen of Shadows I saw people online shipping Rowan and Aelin and totally did not get it. I was certain I would not agree with them, though I wasn't totally sure who I did ship. I was certain their beautiful friendship would only ever be platonic. Then I read QoS. I got to that part, it was like a switch flipped. I LOVE THEM TOGETHER SO MUCH. I think part of the reason is because I adored their friendship, and it became a relationship so naturally, and without taking away all the things I love about Aelin as an individual. Bookworm Boutique is my favourite bookish store. i want everything she makes. Hmmm, I tend to be happy with canon, but I really didn't like Celaena/Dorian. I never understood why people shipped them, and though I understand the relationship from the point of her development and what she needed as she grew as a character, it personally was something I didn't ship. I especialy can't understand why people wont let it go. Cress and Thorne. Honestly reading through each of them assuming the other one didn't like them, that the kiss meant nothing, was so painful. But the satisfaction when they finally worked it all out was wonderful. I have a definite soft spot for Luna/Neville. I think probably because I read so much fanfiction with them together, before J.K came out with that family tree. Also they're both two of my favourite characters, and have super strong friendship skills. I absolutely adore the Marauders, I have a very full and detailed headcanon about each of them and their friendships with each other individually and as a group. Nothing makes me tear up quicker than thinking about them all dying. Harry and Ginny. I mean there is a lot of things I didn't like in the Harry Potter movies but I really, really, didn't like the complete failure of Harry and Ginny to be even remotely believable. So dull. This lovely image was made by Susanne. Probably Rose and Dimitri from Vampire Academy. I just couldn't care that much. I really liked Lord Ballister Blackheart and Sir Ambrosius Goldenloin from Nimona. This is possibly just beause of how much I loved Nimona overall but they're just so sweet. I love how the artwork plays with the way the relationship is explained and I just think it was done really well. Lily and James all the way. I can't tell you how many times I have cried over this couple. October 31 is not about Halloween for me. Marauder era was my go-to for fanfiction. I have so many feels about head-canons and a desperate need for a prequel. 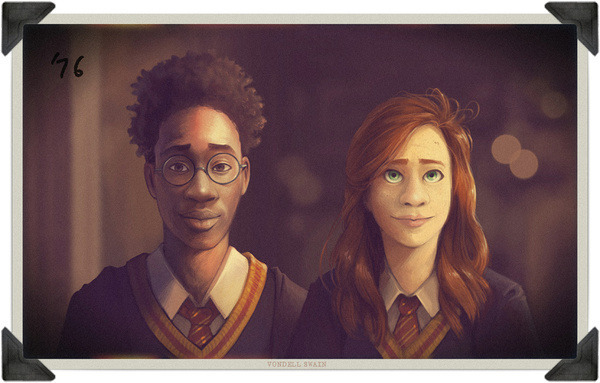 I am so obsessed with the way Vondell Swain imagines Harry Potter characters. I love his work. So those are some of my thoughts about my OTPs (I love that OTP has become something you can have more than one of, like internet linguistics is just so fascinating). I was going to try and have these all from different books but didn't manage. Who is your all time OTP?